^ An Marso 4 amo an opisyal nga pagtikang han syahan nga panahon-hin-pag-alagad hin mangulo. An Abril 6 amo an pag-ihap han Kongreso han mga botos han Kolehiyo Elektoral ngan pag-sertipika hin mangulo. An Abril 30 amo an paghurar kan Washington. 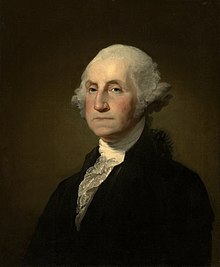 Hi George Washington (Pebrero 22, 1732 – Disyembre 14, 1799) amo an naging siyahan nga Mangulo han Estados Unidos tikang 1789 kutob 1797. Carp, E. Wayne (1990) . To Starve the Army at Pleasure: Continental Army Administration and American Political Culture, 1775–1783. Chapel Hill: University of North Carolina Press. p. 220. ISBN 978-0-8078-4269-0. http://books.google.com/books?id=DL66YCXMbZ8C&lpg=PP1&pg=PA220#v=onepage&q&f=false. Ginkúhà dida han November 13, 2011. Fishman, Ethan M.; Pederson, William D.; Rozell, Mark J., eds. (2001). George Washington, Foundation of Presidential Leadership and Character. Westport, Conn: Praeger. ISBN 0-275-96868-5. Gregg, Gary L., II; Spalding, Matthew, eds. (1999). Patriot Sage: George Washington and the American Political Tradition. Wilmington, Del: ISI Books. ISBN 1-882926-38-2. Higginbotham, Don, ed. (2001). George Washington Reconsidered. Charlottesville: University Press of Virginia. ISBN 0-8139-2005-1. Hofstra, Warren R., ed. (1998). George Washington and the Virginia Backcountry. Madison, Wis: Madison House. ISBN 0-945612-50-8. Johnson, William (1919). George Washington, the Christian. New York: The Abingdon Press. OCLC 19524242. http://books.google.com/books?id=MzWruWAnHM0C&pg=PP1#v=onepage&q&f=false. Ginkúhà dida han December 29, 2011. Vadakan, Vibul V., M.D. (Winter/Spring 2005). "A Physician Looks At The Death of Washington". The Early America Review (DEV Communications) 6 (1). ISSN 1090-4247. "What Made George Washington a Good Military Leader?". EDSITEment: Lesson Plans. National Endowment for the Humanities. Ini nga pakli kataposan nga ginliwat dida han 12:24, 16 Septyembre 2014.